In last week’s blogpost we noted that the pay of senior leaders in secondary schools appears to vary systematically according to their subject background. 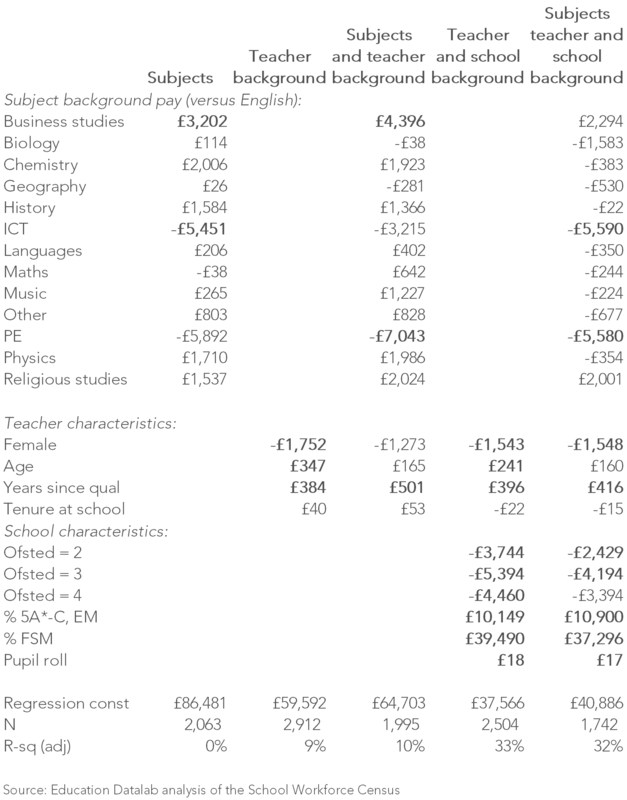 Here we report senior leadership pay in 2010 separately for headteachers, deputies and assistant heads, based on analysis of the School Workforce Census, and look at how it is associated with teacher and school background characteristics in each group. The output reports the pay for each subject, relative to heads with a background in English. Any figures in bold are statistically significant at the 5% level. 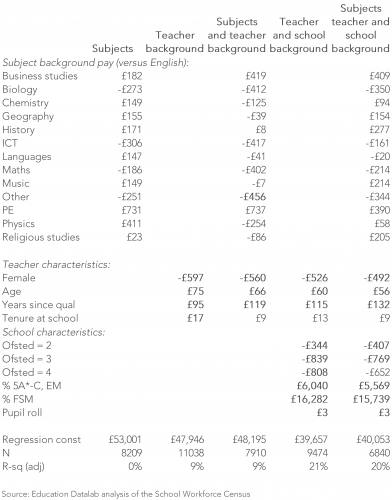 The first column shows that heads with a business studies/economics background earn £3,000 more, on average, and those with an ICT background earn over £5,000 less. Our first task is to see whether these differences can be explained by the demographic characteristics of the heads in question. We can see in the second column, for example, that heads who are female, younger and have less time since qualifying, earn less. 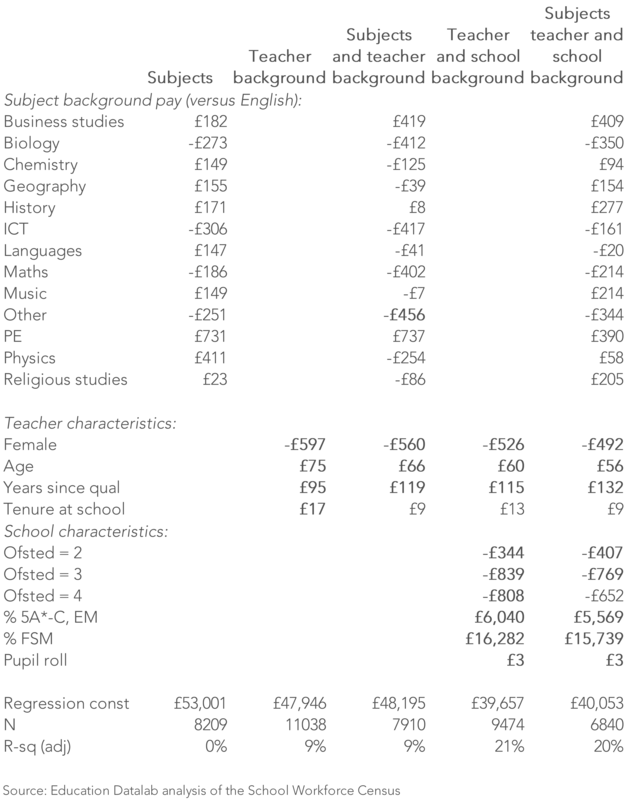 The third column tells us that, after we account for the demographic characteristics of the headteachers, those with a business/economics subject background earn more and ex-PE teachers earn less. 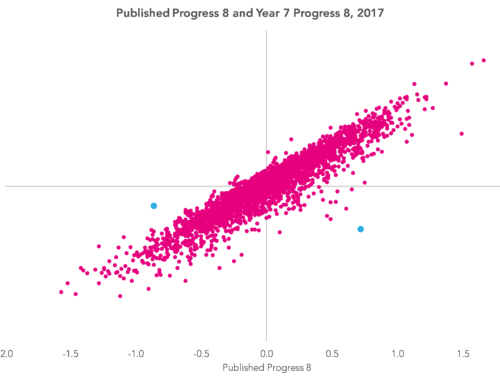 We next include variables to look at the Ofsted rating, latest performance metric (percentage of children gaining five or more A*-C GCSEs or equivalents), free school meals proportion and pupil roll. These factors, alongside the individual characteristics, are important determinants of how much a headteacher is paid (the model accounts for a third of the variation in pay – pupil roll and Ofsted rating are the most important amongst these). The final column tells us that, even when we control for the individual headteacher and school characteristics, there are two subject groups who are paid significant less than headteachers with a background in English: ICT and PE teachers. We repeat this exercise for deputies and assistant heads in secondary schools. 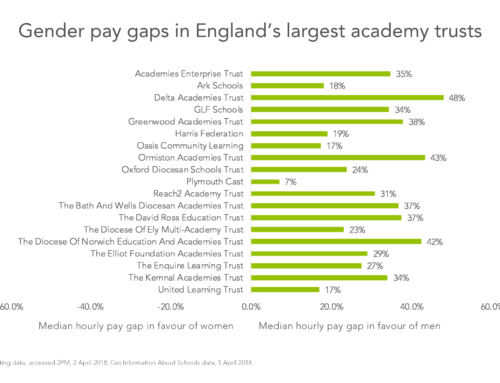 Senior leadership pay has been little researched so far in the School Workforce Census and three areas of enquiry stand out from our analysis. First, is the female pay penalty simply explained by time out of the labour market to raise a family or are there other factors at play (as we suggest there are in work we completed a while ago)? Second, why are heads running schools judged to be requires improvement or unsatisfactory by Ofsted paid less than those running outstanding schools? Is this true on appointment or does it truly reflect their success in post? 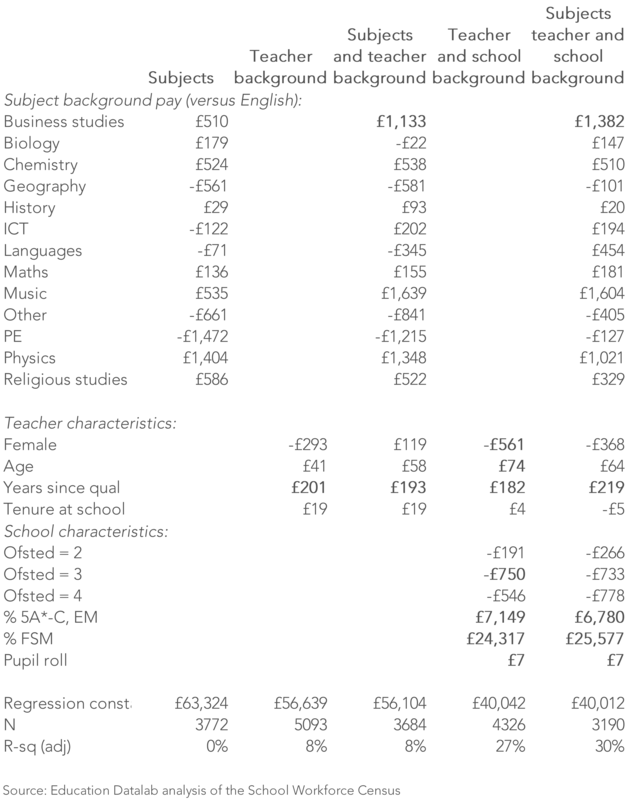 Third, although there are only small differences in pay by subject, there are differences in promotion rates by subject (see Table 3.10 on page 50 here). For example, humanities teachers are much more likely to make it to senior leadership in general. Does this reflect the characteristics of teachers by subject? Or are there other explanations that relate to opportunities to acquire responsibilities within their department? Rebecca Allen is an associate research fellow, having led FFT Education Datalab from its launch in February 2015 to January 2018. She is an expert in the analysis of large scale administrative and survey datasets, including the National Pupil Database and School Workforce Census. In January 2018 she took up a position as a professor at the UCL Institute of Education, leading the Centre for Education Improvement Science. 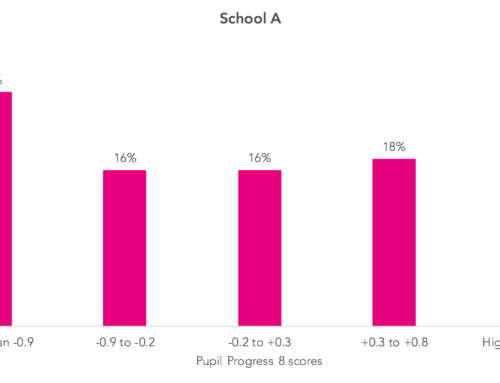 Looking within, part 1: How much difference does within-school variation make? 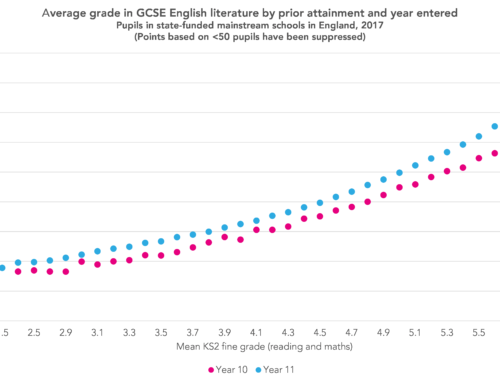 GCSE results 2018: How widespread is early entry in English language and English literature? Progress 8: What if we started at the beginning?